Amazing-Green-Tea is dedicated to helping people appreciate the wonders of tea and other healthy beverages. Someone once said that there are certain things that cannot be adequately explained to a virgin, either by words or pictures. Quality tea is a bit like that. Despite all that has been said about the amazing health benefits of of (especially green) tea, the truth is – few people have had the real thing. Why? Because quality teas are in short supply. Sellers find it hard to sell in bulk. So they dilute quality to the minimum and sell lots of them. Yeah, the products are wrapped up in beautiful boxes. But inside - it’s empty. The tea leaves have no look, no taste and no feel. You should be able to admire the beautiful tea buds or leaves. You should be able to taste the rich and smooth flavors. You should be able to feel the gentle energy flowing, leaving you mind soothed, and your body refreshed. When I tell my friends a T-Volution is already steeping, and everyman in the street will have the chance to drink a cup of real tea – they stare at me with disbelief – what am I talking about? How is this important? With the internet and global shipping, we are just one click away from the best growers this Planet Earth has ever had. Our choices are no longer dictated by corporates and middle-men. You can do research to make an informed choice. You can be the final judge of what constitutes a real cup of tea. We launched our flagship product – the Tribute Dragon Well tea in March 2007. It comes from the same tea garden that caters for the Chinese White House. The same tea leaves were presented to Queen Elizabeth and Margaret Thatcher when they visited China. It is not prohibitively expensive – it starts at 24 cents per gram. Because this is quality leaves, just a tiny amount (2 gram or less) can be infused multiple times to make three cups of tea. It comes with small sampler bags – so you can try a small amount before committing yourselves. This is what real tea is about. It’s rare – but it is becoming accessible. Real tea can’t make you grow younger. But it contains so much antioxidants (in the form of flavonol) that it has a youth-ing effects. According to the 2007 US Department of Agriculture Database, which compares nearly 400 foods for their flavonoid content, green tea contains the highest level of antioxidants amongst fruits and vegetables. ONE gram of green tea contains 127 milligrams of antioxidants, equivalent to the amount of antioxidants found in 500 grams of red wine and 1000 grams of apples! Many doctors urge us to drink more tea because it is safe and cost effective to get your share of antioxidants. Ever since I started this site, I have received many questions regarding the best green tea to drink for health reasons. Yeah, go for unflavored loose leaves. Look for young tea buds rather than matured leaves. Harvested in spring is better. Has to be sealed in air-tight bags and preferably kept in freezer until it is ready to ship. Should taste good, last 3 infusions and make you feel good – this is the most important. The beauty of this T-volution is it starts and ends with yourself. Knowledge brings liberation, only if you are a good student and pay attention. Real tea forces you to sit up and take notice. Take time to steep your first cup of tea. Learn to appreciate its external form, liquor color, multi-layered fragrance and superb after-feeling. Some teas are so good that this pleasurable process can take years to unravel. T-Revolution is an ongoing journey. Every drop you sip will contribute to your well-being. As the tiny streams finally gather into a mighty river, you too will experience some transformations in your life. Sign up to my monthly newsletter to tea friends worldwide! 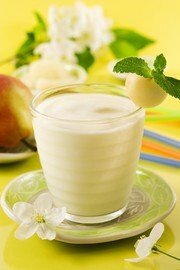 Share this site by bookmarking this page using the widget below..
Almonds add a lovely subtle flavor and extra protein, while yogurt with active cultures benefits your digestive system. This recipe lends itself to variation. For example, try it with fruit, frozen yogurt instead of plain yogurt, or almond milk instead of yogurt for a nondairy version. Step 1. Combine almonds and 1 tablespoon of honey in the blender. Step 2. Blend on high speed for 2-3 minutes, until the mixture forms a smooth paste with the consistency of peanut butter. If you are using pre-made almond butter, skip this step and just add the almond butter in with the other ingredients in step 2. Step 3. Add green tea, yogurt, and the rest of the honey. Blend until everything is smooth. It’s important to blend the honey in with the rest of the ingredients before you add the ice. Otherwise, your smoothie will studded with little chunks of hardened honey. Step 4. Add 1 cup of ice and blend on high until the drink is smooth. Tea Alert: Have you ever wondered which green tea the Chinese President drink for maximum health benefits and great after-feeling? Copyright© 2006-2018 Amazing-Green-Tea.com. All rights reserved.